Next in our Champion Born to Shine on the Centre Line series is Faye Hancock from Farringdon in Oxfordshire. Faye placed 1st in the BD Online Associated Championships Prelim Restricted class with a score of 68.65%. I think when I was about 11, my parents finally gave in and bought me six riding lessons after I was consistently caught riding around on the dairy cows behind our house. Ted is a 9 year old Irish hunter/maxi cob. Bay with a distinctive splodge in the middle of his blaze! Where did you find each other and how long have you been a partnership? Ted was found in Ireland by an exceptionally talented agent friend of mine, Abbie at Hart Equine. I've had him since he was a gangly (much smaller) 4 year old. I bought him to hunt but decided to really have a crack at dressage just over a year ago. Like all horsey people obsessed with their own horse, yes, lots. How long do you have?! Onwards and upwards to Novice now, I guess! Show jumping. Throwing an 18hh maxi cob over poles can be rather hairy... but he's getting more gymnastic every day. Just his sheer size can be the biggest challenge day-to-day. I had to buy a new trailer and all his tack has to be made to measure. And of course he has to have the biggest stable!! Probably all the small things. Like teaching him to be patient enough to do gates, or trust me enough to walk straight over a motorway bridge. We recently went to TeamQuest Regionals and loved every minute of being there. A few people at my yard were doing it and I thought we'd give it a go. I'm also an RDA coach so really promoting for all our riders at the Abingdon Group. It's great to get an idea of what judges are seeing and where you can improve or what is good. You can really get everything together before attempting to go out and show your best in a big shiny arena. 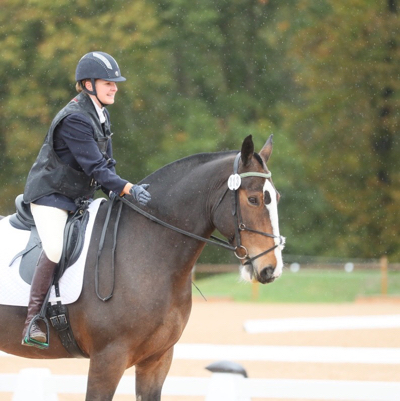 For RDA riders there isn't always an opportunity to go out and compete, or it can be very daunting. So it's great to be able to ride a test in the safety of familiar surroundings. About a year I think!